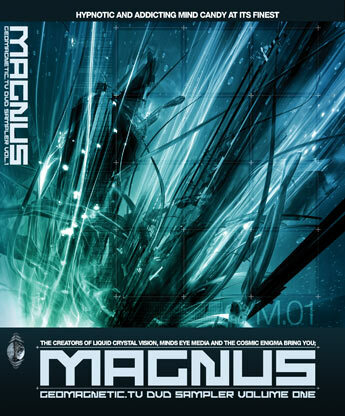 V/A "MAGNUS- Geomagnetic sample v.1 "
Magnus is the newest release from the folks who brought you Liquid Crystal Vision, Minds Eye Media and the GodEgg. This DVD fuses together the talents of some of the worlds hottest VJs and psychedelic computer graphics producers with the worlds leading electronica and Psytrance music. This never before seen collection of high quality 3D animation and trip visuals will blast your brain into a new form of visual and audio enlightenment. So get ready to not blink for the next 90 minutes as you interface with Geomagnetic.tv DVD sampler volume one. Dr. Spook has compiled some of the most breathtaking psychedelic videos ever created. Each of the artists are well known for being leaders in this mystic and provocative visual art form. The music and videos complement each other perfectly inducing a state of euphoria with no other additives needed! ABA Structure with Irina Mikhailova, Growling Mad Scientists with X Wave, David Battenfield, Ursa Minor, Sasha, Scorb, Devient Species, Chromatone, Medicine Drum, Shpongle and more. Presented as an interactive 3D animated menu driven experience, With default option PLAY ALL ready for parties. By DJ Doctor Spook. Interface Audio engineering by Earthling. Disc 1: DVD Video Format TRT: 90 Minutes+ of 3D Animation and Wild Visual FX and Music Videos. Special Features incl. VJ demos reels and Artist Interviews and Previews for upcoming releases + AC3 Extrapolated Audio mix in 4:3 NTSC High Resolution 6.0Mbs encoding.